“Look Both Ways” features 31 works by 20 artists, including a large installation, several sizable sculptures and wall-works, as well as a number of moderately sized works. It also introduces Hosfelt Gallery’s grand new space — a light-filled, high-ceilinged, industrial-raw space encompassing 8,900 square feet — in the Potrero Hill area of San Francisco. The exhibition is a sampling of highlights from an illustrious stable artists: Alan Rath, Jay DeFeo, Tim Hawkinson, and Jim Campbell among them. And not only does it celebrate what’s transpired over the gallery’s 15-year history but also, with the introduction of several new artists as well as new work by long-standing artists, looks forward. One highlight of the show is that several of the larger works – including Liliana Porter’s installation “Man with Axe,” the mechanized sculpture “Lala Zaza” by Rath, and Hawkinson’s whimsical “The Fin Within” – are to their benefit provided ample room to breathe in the expansive gallery space. And while there are works in a number of different mediums — mechanical sculpture, paintings, drawings, photography — and varied formal orientations — bright, subdued, detailed, minimal, organic, reflective — it all manages to hang together, a nod to good curating. On the note of curating, and further addressing the space of the gallery, one of the stated goals of the exhibition is to present “work that exists on one level when seen from a distance, but that is something else up close.” There are several instances where this is particularly evident, one of which is Campbell’s light sculpture “Tilted View.” From afar, it’s a suspended plane of small, white globes, with shadows of what could be overhead clouds creating subtly greyed areas that float across their surface. Step in closer and the orbs break down into their individual units, each one hanging from a black wire. The illusion of the changing skycap is, it turns out, programmed patterns of light fed into small bulbs. The image has been pixilated, albeit it is no less lyrical for knowing that. Emil Lukas’s elaborate wall-hung “Horizontal Ring” reads at a distance as a colorful abstract image that shifts as you move around it. The fine and innumerable pieces of thread that comprise the piece become evident as you get closer; they are strung from nails tacked into the sides of the frame, akin to the string art we were all introduced to in childhood, though taken to a whole new level of intricacy and layering. The effects are delightfully dizzying and dynamic. Also by design, another common thread here is an emphasis on a visual hook to draw us in only to slowly reveal a greater depth. While the works throughout the show are consistently engaging, there are a few that stand out, particularly in this regard. 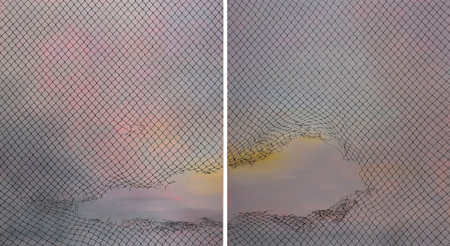 The breathtaking oil-on-canvas diptych “Breakthrough,” by Driss Ouadahi, features a broken chain-link fence with only sky behind it, here a purple and yellow sunset. This photorealistic work makes an immediate impact: it’s expansive, all-encompassing, and gorgeous. Sit with it for awhile and thoughts of imprisonment, escape, longing, and “it’s better on the other side” readily come to mind; then the patterns of the fence take on a meditative quality, disrupted by the snared imperfections. While it’s easy to get wrapped up in the presence of the grander works, there are a number of modestly scaled pieces that hold their own: lively and colorful ink-and-acrylic on paper works by Rina Banerjee, simple yet poignant collages by John O’Reilly, and delicate monochromatic watercolors by Nicole P. Fein. It adds up to a celebration of thoughtful, complex work and a tantalizing foreshadowing of things to come.